Oommen Chandy also questioned the credibility of the letter written by prime accused Saritha S Nair, which forms part of the 1,073 page report, in which she has levelled sexual and corruption charges against him and several well-known Congress leaders, including two MPs and MLAs. 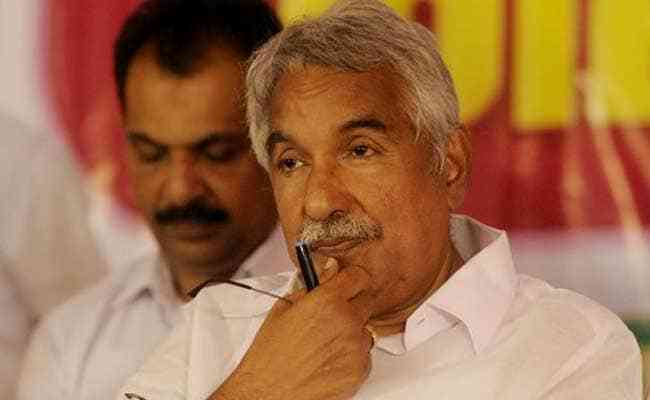 A day after being indicted in the multi-crore solar scam, former Chief Minister Oommen Chandy today lashed out at the Judicial Commission that probed the matter, alleging it was "prejudiced". Mr Chandy also questioned the credibility of the letter written by prime accused Saritha S Nair, which forms part of the 1,073 page report, in which she has levelled sexual harassment and corruption charges against him and several well-known Congress leaders, including two MPs and MLAs. Addressing media persons at the Congress headquarters here, an unfazed Mr Chandy said that the party was not 'panicky' and would fight the charges legally. He alleged that the Commission was silent on the fact that 'Team Solar', floated by the accused, had begun its operations during the tenure of the previous VS Achuthanandan-headed LDF government. The "solar scam" had rocked the previous UDF government headed by Mr Chandy after reports surfaced in June 2013 that some of his staff were involved in alleged cheating of several persons of crores of rupees by Ms Saritha and her accomplice Biju Radhakrishnan by offering solar panel solutions. The four volume report by the Justice G Sivarajan Commission that probed the scam was tabled by Chief Minister Pinarayi Vijayan in the state assembly yesterday. "The Commission had not verified the veracity of the letter and credibility of the person who wrote it. The panel also did not examine the circumstances by which two letters (by the accused) have emerged. What justice is this?" Mr Chandy asked. Ms Saritha's letter which was originally 21 pages as per the jail superintendent's statement before the commission had now turned out to be a 25-page letter, he claimed. The Congress veteran also claimed that an independent witness had deposed before the commission that his name (Mr Chandy's) was not there in the actual letter, said to be written by Ms Saritha when she was in jail. "But the commission did not consider this. All the recommendations in the report were prejudiced. The Commission has not said anything new.... it has just pointed out the contents of the letter," Mr Chandy said. He reiterated his charge that one of the four volumes of the solar report was not signed by Justice Sivarajan and sought the CPI (M)-led LDF government's reaction on the matter. Taking a dig at the government, Mr Chandy said it was heard that they would initiate legal proceedings against all leaders who were associated with the Team Solar company. "But the project began during the time of the previous LDF government. They had even published an advertisement with pictures of then Chief Minister VS Achuthanandan and other ministers," he said showing a copy of the newspaper that published the ad in 2010. The Congress and UDF would unitedly fight the charges, Mr Chandy added. The former chief minister said he would reveal the name of the person who had allegedly 'blackmailed' him in connection with the scam at the appropriate time. "I will tell you the name, you must wait", he said. The Sivarajan Commission, set up by the Chandy government, has recommended that the state government seriously consider applicability of the provisions of Prevention of Corruption Act against whom corruption and illegal gratification have been alleged by the accused in connection with the solar scam. The Commission stated that then "Chief Minister Oommen Chandy and through him his personal staff--- Tenny Joppan, Jikkumon Jacob, gunman Salimraj and (Thomas) Kuruvilla, his aide in Delhi, all had assisted Team solar accused Saritha S Nair and her company in enabling them to cheat their customers."